RME releases always peek our interest here at Scan when they happen as they constantly appear at the top of benchmarking tables, meaning RME drivers are quite often the ones to beat when we do group testing. The Babyface range itself have been the entry level introduction to the range for a good few years now, with a feature set that that makes them perfect for the home or on the move recording artist. So with the news reaching us that they’ve released an upgrade to this workhorse interface and the claims that it isn’t just a remaster, rather a whole reengineered beast, well of course we’re going to be intrigued. 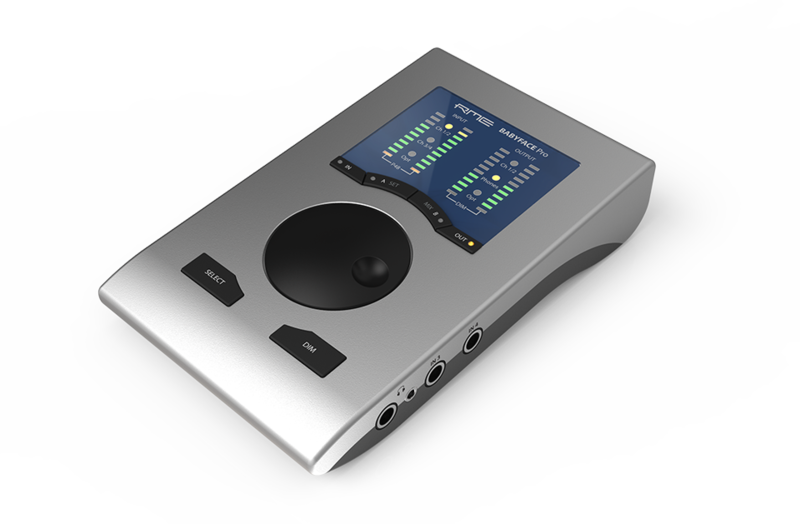 The first thing that leaps out at you is the physical redesign of the RME Babyface Pro over its early version. The overall shape has been refined althrough it does keep it’s light, yet strong, aluminum case design but overall no big suprise here. However if we take a look around the back of the RME Babyface Pro we see a different story altogether. The original design had those connectors now found on the side, at the rear and the XLR and a number of other connections, hanging off a breakout cable from the rear of the unit. This meant that if you wanted a 2 in / 2 out on the road you could carry just the main interface, but if you wanted a balanced solution or a bit more I/O, then the only way to do so, was carry the breakout cable. Having checked the early discussions on this new design, it appears that some people love the removal of the breakout cable, where others are not so sure on the design of having cables plugged into 3 sides of the unit. Personally we’re liking the fact that without the breakout cable, its one less thing to forget or lose out on the road and feel that it only adds to the portability of the unit itself. For monitoring purposes the RME Babyface Pro has twin headphone jacks come in both TRS and mini-jack form factors both with their own driver stages in order to offer better matching with both low and high impedence headphones. For audio going into the unit the two digitally controlled preamps provide individually switchable 48V ‘phantom power. These brand new circuits feature gain of up to 70 dB, adjustable in steps of 3 dB, plus a relay-driven PAD, resulting in exceptional EIN (Equivalent Input Noise) performance as well as line overload protection, and enough gain for even the lowest level microphones. Finishing off the I/O options the feature set continues with an optical TOSLINK I/O; use as either an ADAT port with SMUX support or SPDIF for sessions up to 192 kHz. In combination with an external ADAT converter, the Babyface Pro fully supports 12 analog inputs as well as 12 outputs, making it ideal for both live and studio multi-track applications. You can plug any instrument, line or high impedance, into Babyface Pro’s jack inputs 3 & 4. Record your guitar on the go, with no additional hardware required. MIDI I/O via an included breakout cable completes the package. Software wise the RME Babyface Pro ships with the RME ever superb Totalmix and we’re infromed the has been a convertor upgrade as well meaning an even better signal path on this version over the previous generation. Lastly but no doubt pretty important for those users with an interface on the road, the RME Babyface Pro design almost never requires an external power supply, designed to run stable on the higher current USB 3 buss power found on most modern laptops and even most modern USB 2 ports, with no degradation in any technical specification. Kids that Drum on Tabletops or Carseats or wherever…….. Casting an eye over the Intel i7 Skylake X editions.